The Legend LX regulator series incorporates a proprietary over-balanced diaphragm first stage design coupled with a high performance balanced second stage. The over-balanced first stage achieves unprecedented performance by increasing your air supply the deeper you go. The balanced adjustable second stage reduces breathing resistance to near zero with a lightweight balanced valve seat designed to respond instantaneously to the slightest inhalation. 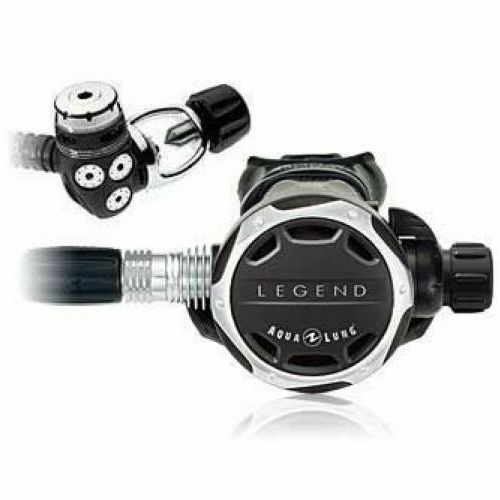 The Legend LX regulator series is the best performing regulator Aqua Lung has ever offered. Legendary performance from Aqua Lung: a tradition for 60 years. The Legend LX diaphragm first stage combines the reliability of a completely sealed unit with the ease of breathing and quality construction common to all Aqua Lung regulators. The Legend LX adjustable balanced second stage delivers air with consistent ease regardless of tank pressure and is near neutrally buoyant in the water. Auto-Closure Device (ACD) seals the regulator's inlet fitting, both Yoke and DIN, as soon as the regulator is removed from the cylinder valve. This will keep water and contaminants out of the regulator's first stage during rinsing and storage.